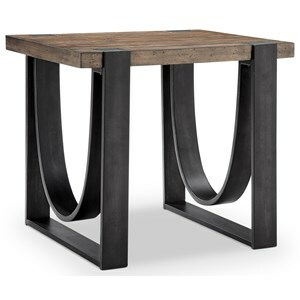 This stylish sofa table is the epitome of balance with its symmetrical, geometric design while its richly finished top and distressed iron finished base keep this piece from looking too polished. 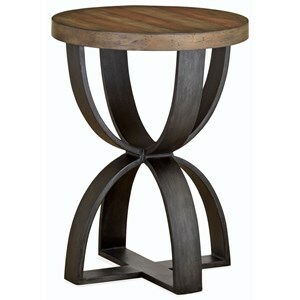 Its mix of materials of a solid wood top and metal base ensures this piece will stand the test of time in its construction as well as in its timelessly pleasing style. 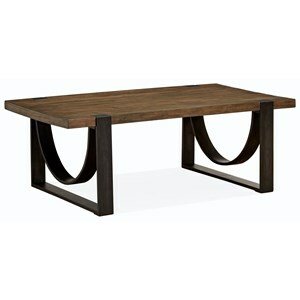 The Bowden Rustic Rectangular Sofa Table of Solid Wood by Magnussen Home at VanDrie Home Furnishings in the Cadillac, Traverse City, Big Rapids, Houghton Lake and Northern Michigan area. Product availability may vary. Contact us for the most current availability on this product.